In between Violator and Songs of Faith and Devotion, a lot happened: Nirvana rewrote the ideas of what "alternative" was supposed to be, while Nine Inch Nails hit the airwaves as the most clearly Depeche-influenced new hit band around. In the meantime, the band went through some high-profile arguing as David Gahan turned into a long-haired, leather-clad rocker and pushed for a more guitar-oriented sound. 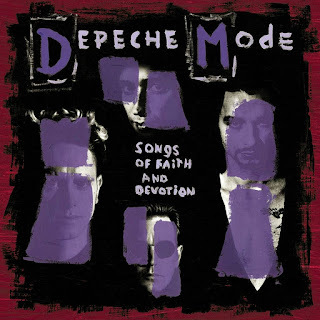 Yet the odd thing about Songs of Faith and Devotion is that it sounds pretty much like a Depeche Mode album, only with some new sonic tricks courtesy of Alan Wilder and co-producer Flood. Perhaps even odder is the fact that it works incredibly well all the same. "I Feel You," opening with a screech of feedback, works its live drums well, but when the heavy synth bass kicks in with the wailing backing vocals, even most rockers might find it hard to compete. Martin Gore's lyrical bent, as per the title, ponders relationships through distinctly religious imagery; while the gambit is hardly new, on songs like the centerpiece "In Your Room," the combination of personal and spiritual love blends perfectly. Outside musicians appear for the first time, including female backing singers on a couple of tracks, most notably the gospel-flavored "Condemnation" and the uilleann pipes on "Judas," providing a lovely intro to the underrated song (later covered by Tricky). "Rush" is the biggest misstep, a too obvious sign that Nine Inch Nails was a recording-session favorite to unwind to. But with other numbers such as "Walking in My Shoes" and "The Mercy in You" to recommend it, Songs of Faith and Devotion continues the Depeche Mode winning streak.